Sometimes the fun has to yield to reality, and tonight is one of those times. I'm writing this from a motel on the northeast side of Oklahoma City, with one eye on a local TV station's Doppler radar. Two major tornadoes are passing through the area. One passed about nine miles south of me after destroying the town of Moore, 20 miles to my south, then crossed Route 66 thirty miles east of me, near Warwick and Chandler; the other is aimed right for El Reno and Yukon, Route 66 cities west of town. As I checked in, the desk clerk warned me that if a siren sounds, I should hide in the bathroom to protect myself from potential flying debris. But as of now, the power's on, the sirens are silent, and I'm going to get back to happier topics. As you may recall, I started the day in Springfield, Missouri. At first I wondered why there were so many new, cheap motels in town -- but as I checked out this morning, a wallful of brochures reminded me that Springfield is the gateway to Branson, America's tackiest town. Literally dozens of third-rate entertainers -- Yakov Smirnoff, various Osmonds, the Lennon Sisters -- operate dinner theatres and other shows here. While I consider plumbing the depths of American popular culture a part of my obligations while on the road, there ARE limits. I continued west. Past Springfield, Interstate 44 carries most of the traffic southwest of Route 66 -- and probably carried away the lifeblood of a half-dozen communities on 66. Halltown survives as a collection of antique vendors, but Phelps, Avilla and other towns have more abandoned buildings than occupied ones. Feeling a little guilty about skipping Branson, I kept my eyes open for other distractions. What I found horrified me: the Precious Moments Chapel south of Carthage. If you don't know what Precious Moments figurines are, they're adorable cherubs with teardrop-shaped eyes and, often, halos or angels' wings -- especially popular among the nursing-home set and those whose idea of literature includes Readers' Digest Condensed Books. Sam Butcher, their creator, was working as a fry cook in Redding, California when he Found God and began creating these bilious creatures; his empire now includes the Precious Moments Chapel, Precious Moments Best Western Hotel, Precious Moments Wedding Island, The Fountain of Angels, and the all-important Precious Moments Gift Shop. Admission to the Precious Moments Chapel is free, and worth every penny. 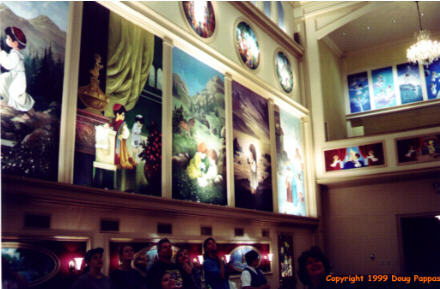 The Chapel features 52 Biblically-inspired murals, all executed in cloying pastels, with every character drawn Precious Moments-style. I especially liked the Fourth Day of Creation, which for some reason includes Mr. Butcher's vision of two adorable little boy-angels, one white and one black, apparently playing basketball. It accomplishes the rare trifecta of simultaneously offending one's artistic, historical and religious sensibilities. Couldn't wait to get out of there; I was so repulsed I wouldn't even buy a small figurine or two as joke gifts for friends. I wouldn't even shoplift the damned things. 66 nicks the southeastern corner of Kansas before passing into Oklahoma. This is the mining country which produced Mickey Mantle; his hometown of Commerce, OK is building a museum. Near Afton, I found a long-bypassed section of 66 which is only one eight-foot lane wide: the local government didn't have enough money to pave both lanes, so two cars passing in opposite directions both had to drive on the shoulder. Next came a 90-foot totem pole, reputedly the world's tallest, carved over a nine-year period by a local eccentric -- a prototypical roadside stop. In its heyday, Route 66 was often known as the Will Rogers Highway. Rogers himself is buried about a mile north of the road in Claremore. Rogers and aviator Wiley Post died in 1935 when their plane crashed just after takeoff from Point Barrow, Alaska. To gauge public reaction to Rogers' death, imagine if Johnny Carson or Walter Cronkite had been on the Challenger when it exploded. Rogers was a combination of Carson and Cronkite: a beloved actor/radio performer who also wrote a regular newspaper column and covered political conventions for the New York Times. 66 connects dozens of small towns between Tulsa and Oklahoma City with miles of scenic countryside. I first heard the tornado warnings about halfway along this drive. Didn't worry at first, because the funnel was thirty miles southeast of Oklahoma City -- but that one storm has now traveled 65 miles northeast to pass directly over the route I had taken. Everything around Oklahoma City seems to have been hit by a tornado or a severe thunderstorm, but with the last known storm having passed, the city itself has escaped virtually unscathed.